Right in the middle of her forehead. But when she was bad she was horrid. That old Mother Goose nursery rhyme comes to mind often in my work. Women sitting there telling me of all the beautiful meals they make for themselves “when I’m being good.” There’s a self-righteousness to these parts of their food day, a certain pride in the fact that they’ve learned the rules and show a sense of discipline. These same women go on to tell me about later in the day – during that afternoon dip or once supper’s over and they’ve settled in front of the TV. That’s “when I’m being bad” and their poor food habits show up. When the office candy bowl and cookies and ice cream and the repeat visits to the fridge take over all sense of reason or strength of will. One client recently referred to such bad habits as “sins” – insinuating that there is a moral transgression being committed, one punishable by God. Ouch. Is that tendency a part of the perfectionist’s personality? That when you’re being good, you’re very, very good, and when you’re bad you do so with equal zeal? Which certainly translates to those sins being well worth the self-flagellation and berating you offer yourself in return. Double ouch. That’s the kind of black and white thinking your inner perfectionist no-doubt craves. There ends up being no room for grey zones. Unfortunately, nutritional advice has evolved into nothing less than one huge grey zone. The lines get very blurry from one style of eating to the next, and even blurrier between experts on a given style. Even so, when you decide on a specific set of rules, you will accept nothing less of yourself than following those rules to the letter as outlined by one of said experts. Sometimes to the sacrifice of your likes and dislikes. Or in ignorance of your emotional state or how active you’ve been or the fluctuations through your cycle. Sometimes cutting out any sense of celebration. 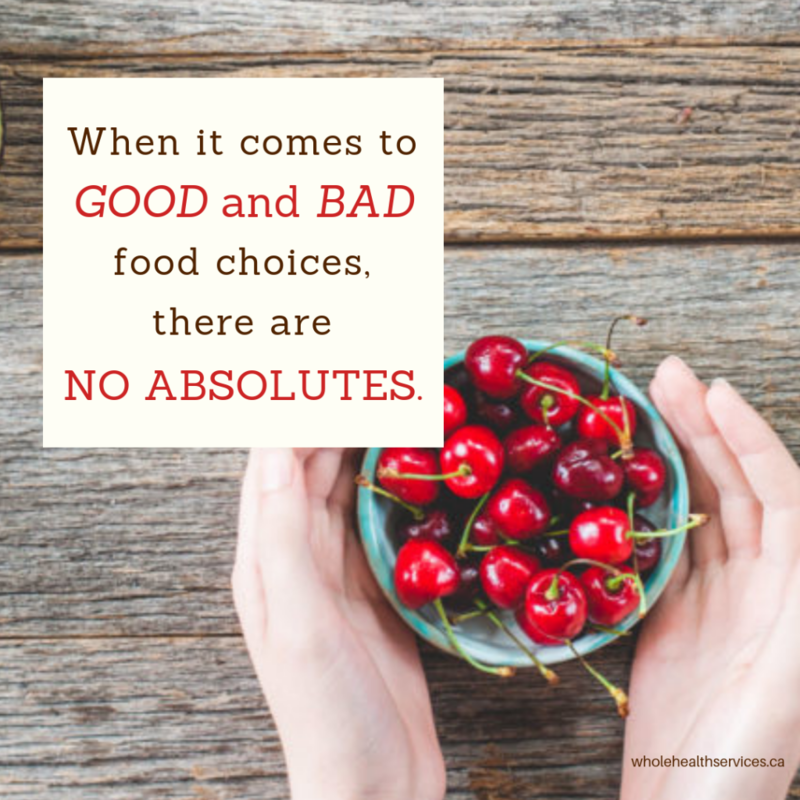 Yet, when it comes to “good” and “bad” food choices, there can be no absolutes. I do the air-quote thing on purpose when using those words with students or clients. I want to emphasize the fact that the goodness or badness of a food or an eating habit is relative. We all know sugar is “bad” for us, more so for those dealing with such conditions as Type II diabetes or cancer. Even when calming inflammation of any kind (including those 15 lbs that have set up camp on your middle), sugar will feed the issue. In that sense, sugars from any source need to be taken into consideration, whether it’s from a candy bar or a PB&J or a carrot or a glass of wine. At the end of the day, they all contribute to how much sugar you’ve taken in. That is, the carrot has potentially become one of the “bad” guys. That said, sugar is our cleanest energy source and getting a certain amount (up to 10% of your daily calories) makes life a heck of a lot more pleasant and your body function more efficiently. When you focus on whole foods and eliminate the added sugars, you can easily stay within those limits. At which point a carrot, full of fibre and antioxidants along with the sugar, is a “good” source. In In Defense of Foods, Michael Pollan shares another great example from psychologist Paul Rozin. From a list of foods, study participants were asked to consider which food item from a given list they would choose to have on a desert island (along with water). Participants chose bananas, spinach, corn, alfalfa sprouts or peaches over hot dogs or milk chocolate. However, on that desert island, that hot dog might be your only source of protein for a few days, the chocolate will keep your blood sugar happy and your mind alert. Of all of the above, they would increase your chance of survival. And then we get into the actual enjoyment of good food. How well will your body take in and use the nutrients of a healthy bowl of steel-cut oats and ground flax if the texture grosses you out and you can barely swallow, let alone chew it? If you pinch your nose to get through the steamed kale, is it possible your cells will be pinched on the inside? In Chinese tradition, when the shen (your spirit) tastes the food or herbs in your mouth, that is the first stage of your organism’s ability to take it in. Remember taking that first bite – how buttery or complex or pungent it was – what happens in your body? As you imagine the flavours expanding in your mouth, don’t your shoulders drop? Do you maybe let out a big sigh and fall back in your chair ever so slightly? You’ve relaxed – engaged the PNS – improved your digestion by simply savouring your meal. Now repeat the exercise with the last thing you ate out of righteousness. I’ll bet you feel a little more tense from that one. Which brings up the question, is food “good” because of its nutrient profile or because it tastes good? Engaging your taste buds also attunes you to the fact that tasting “bad” may mean that a food has gone bad; mouldy or rancid or rotten. It may be telling you that the food in question is actually bad for you in some other way. Try eating a fast-food burger slowly, savouring every bite. How does it actually taste? Feeling bad – physically, mentally or emotionally – after eating a particular food is another way your body tells you to steer clear. 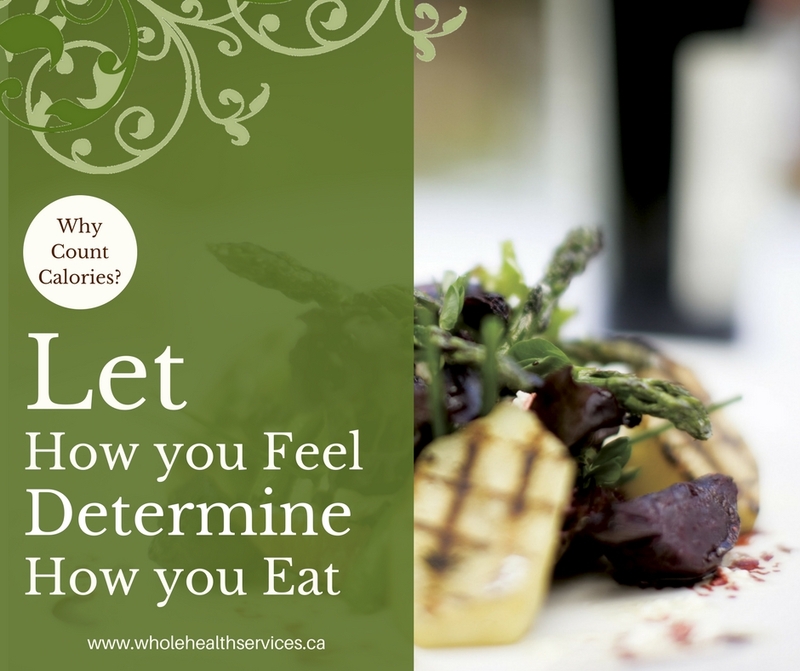 This is your individual decision, regardless of how nutritious the actual food. Do I have a solution to offer you for maintaining good eating habits? * Mindful eating – slow, deliberate and seasoned with gratitude. This extends to mindful planning, grocery shopping and cooking. As they say, most of healthy eating is in the prep. * Engage the relaxation response throughout your day, with breathing exercises, meditation or generally loosening the strictures on your image of what the “perfect” (yes, that one’s relative too) meal, or the “perfect” life, need be. * Forgive yourself when you’ve been “bad”, knowing you can start again at the next meal. Beating yourself up for your less than “perfect” choices does you more harm in the long run that the junk food. * Take responsibility for your choices. Stay away from stuff you know is “bad” for you (see above). If, however, you choose to go ahead, know that it may involve consequences on one level or another. YOU have the power of choice over the food you put in your mouth, not the other way around! * Step back and explore your emotional state before you go back for that second helping of [insert “bad” choice]. Rather than a grey zone, I prefer to think of healthy eating habits as a full-spectrum. Not black & white, but exploding with colour. Just like all the best food. The word “healthy” comes from the same root as “whole”. By letting your whole self be a part of the action – the “good” bits and the “bad” bits of you – you are feeding yourself from a place of fulfillment. You fill yourself with more than parcels of nutrients (or junk) and will be more satisfied and healthier for it. Which part of your eating habits do you consider “bad” and what do you do to make it better? When you offer your thoughts in the comments, you open the possibilities for others. Share this post with any friends struggling with getting control of their eating habits by using any (or all!) of the pretty green buttons. Many of the health-based conversations I have lately revolve around motivation. Actually, it’s not just with health. We’ve got so many reasons why we can’t find the energy to improve our eating habits or our self-care routines or our parenting or our relationships or our work. Excuses run rampant through your head and stuff happens in your life which stops you from moving forward with your best intentions. Like when you make a conscious decision to eat more vegetables, cut out the sugar and take a proper break for lunch. Then the usual reasons come flooding in, “reminding” you why you need eat at your desk, and grab a slice of banana bread every afternoon. How many times do you blame your boss or a colleague for the amount of stress at work, or your husband for the lack of intimacy in your marriage? Even in my woo-woo circles, people seem to love hearing that Mercury Retrograde is in full swing, because it offers a cosmic reason why every type of communication and forward motion they attempt gets derailed for days or weeks at a time. When you weed through the tangle of every possible reason you can’t or don’t move forward, it usually filters down to some form of resistance. Resistance is the current catchword that practically gives us permission to stay stuck where we are. Now you feel heard and understood, but you’re no further ahead in the face of your frustrations. What if resistance weren’t a bad thing? What if it had a purpose other than making you feel that the Universe is conspiring against every effort you try to make? Let’s start by doing a little physics lesson. Electrical resistance is valuable. You actually make practical use of it; without it, the appliances in your house wouldn’t work. It takes so much energy for the flow to get through the little filament in a standard lightbulb, that the wire heats up and gives off light. The element in your kettle and oven work the same way. The volume control on your TV has a variable resistor that lets more or less sound out when a little or a lot of resistance is applied. Apply the same principles to the flow of movement you want to create in your life, like when you’re trying to eat better. First and very important point to repeat: a resistor is a passive component. Like the rain, it’s neither good nor bad, it’s not the Universe’s way of trying to derail your efforts. It’s just there. It’s the nature of the resistor and your level of opposition to it that causes the issues, and determine how hard you have to work to get around it. So, you’ve decided to cut out sugar. Inevitable circumstances happen (as described above) which make it harder to plan and get around the shortcuts. * The associations start to surface: the need for a cookie or a big plate of pasta after an argument, the need for a drink after a hard day at work. Those parts of life come up. They just are. You can choose to fight those facts and listen to the voices, you can let them derail you – not to mention increase the pain of the pressure they inflict by beating yourself up about it. Like with the electrical resistor, the energy you use to let these circumstances antagonize you will only get dissipated. All the effort you would have put into the doing of the improvement gets diverted in any number of ways. terminate transmission lines, in other words, stop you in your efforts altogether, like when you cheat on the second day and give up completely. Great for the electrician who places a particular component into his circuit to achieve one of those specific electrical effects, but how can this have a purpose for you? Could it be that the Universe places those resistors in your life for a specific reason as well? Going back to the cosmic example will make this point easier to understand. As frustrating as it can be, Mercury Retrograde has a purpose in your soul’s journey. It forces you to stop what you’re doing, take stock and re-evaluate whether those are in fact the steps you want to be taking. Its energy could even make you look backwards and force you to see (and shed!) some of the baggage that’s still dragging you down around this particular movement. What if, like with Mercury Retrograde, you could look at those circumstances as a need to slow down and re-evaluate? Is your time worth more that the overall quality of the food you eat? How can you set yourself up to weather sudden changes in the day? Do you need to recognize the voices in your head as your ego trying to steer you clear of failure? Is it time that you released your mother’s “helpful” comments into the compost of no-longer-serve-you items? If you can’t avoid stopping for food as you rush from A to B, is there a wiser choice you can make? If not, can you swallow a side order of compassion with the chicken nuggets? The other term that comes to mind as I let the word dance around in my head is resistance training, AKA strength training. This is the practice – with weights, machines, straps and certain yoga poses – whereby you contract a muscle against an external force to improve strength, tone and endurance. 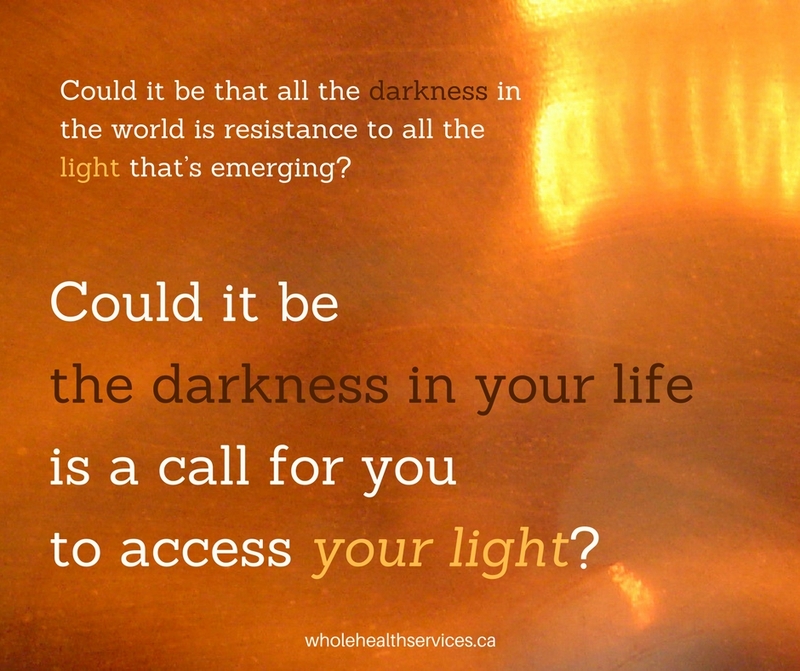 What if you use the resistance that shows in your life up as the means to strengthen your resolve and your efforts? That is, sometimes we need to be reminded that life changes, big projects, enriched relationships take a certain amount of effort and work. The pride you feel from saying no to the fries or the cookie on offer provides an energy boost to your stamina for doing better yet again tomorrow. The more you exercise the buy-&-cook-more-vegetables muscle this week, the more efficiently you’ll flex it next. The relief of saying No, that is when the pressure to say to say Yes is lifted from your shoulders, you’ll be able to stand that much taller in your resolve and your needs. Strength training also improves bone density, your circulation, blood sugar balance and coordination – it impacts more than just the muscles doing the direct work. Using your energy to lean into, work through or push past the hindrances that show up in your life will have an overall benefit to your entire being. Balance, flow and peace of mind can only follow when you move with life as it happens rather than fighting it. Slowing down to work with the resistance that shows up in your life gives you the energy necessary to shine brightly and speak loud & clear through the flow of your personal current. Let me put this another way: the root of the word resist is sistere, Latin for “to take a stand”. When faced with resistance, you are being called to (again) take a stand for who you are, your values, your priorities, and how you want to move through life. How do you get past the resistance that blocks your efforts? When you share in the comments, you open the possibilities for others. I credit Wikipedia and explainthatstuff.com for a bit of a physics refresher. Thanks to emedicine.com and nerdfitness.com for details about strength training. Rather than count calories, I prefer to follow the kindergarten rules, or what my family calls the cottage rules. You know, eat when you’re hungry, stop when you’re full. The very basics of listening to your body also include sleeping when you’re tired and going to the bathroom when you get the urge. Yes, there are days when I don’t heed those signals. Some days I eat too much; other times I eat too little or stay up too late. In the end, it all evens out…more or less, maybe gaining or losing a few pounds here and there. Being healthy is the key for me, more than the weight. Feeling energized enough to do what I want to do in life, and fitting comfortably into my clothes. With so many variables in life draining our worry batteries, something as basic as eating ought not be added to that list. Better to stay present to your body and your food while you eat it, and pay attention to when it’s had enough or needs more. So, let me expand on some of those rules. Here’s a rough guide to some of the ways your body talks to you at mealtime, what it might be saying, and how you might want to respond. 1. Hunger is your body’s way of saying your blood sugar’s getting low, i.e. your brain needs food. Choose something nutrient dense (not refined) to ensure that your blood sugar will stay on an even keel for a good while. 2. When you start to feel energized during a meal, that’s a sign you’ve had enough and your digestive tract has started to work on it. Yes, this requires you to slow down and draw a certain amount of awareness to your body as you eat. 3. If you feel sluggish at the end of a meal, you may have eaten too much, and more energy than necessary has been diverted to its digestion. Other than just wait it out, and not engage in anything too strenuous, you can take some bitters to speed the emptying of your stomach. 4. Getting jittery or sleepy immediately after you eat starchy/sweet food can be a signal that you’ve eaten too little protein or fat or fibre in that meal/snack. Eat a stalk of celery, to help your body metabolize the excess sugar, and a handful of nuts or seeds to add protein, fat and fibre into the mix. 5. A heavy feeling, like the food’s just sitting in your stomach can be the result of a fat-rich meal. For me, it’s always the creamy dessert at the end of a big meal that does it. Alcohol can also slow down or even stop your digestion. The heavy feeling may also indicate low stomach acid, especially if you just ate a meat meal. Heartburn, belching, constipation and gas are other symptoms of that state. Drink a shot of water with lemon juice or apple cider vinegar to stimulate your stomach and get things going. When I was 14, my girlfriend and I came up with the rule that if you eat the same number of calories as your best friend, they cancel each other out. We were notorious for making Dagwood-worthy sandwiches and decadently dressed ice cream sundaes, so it was crucial that we find a way to be “allowed” to eat that way and still be true to our Seventeen-inspired world. There may be no scientific proof, but I still believe in that theory. Enjoying a meal in the company of people you love, of friends who make you laugh and stimulate your mind – people with whom you can truly be yourself – is just as nourishing to your being as the food on your plate. Have you ever noticed you can eat some of your no-no food on holiday without issue and you might even lose weight? Or, that you can drink cocktails & wine at a party where you deeply connect with others and get no hangover? If your heart, your mind and your soul are nourished as well as your body, you raise your vibration, stoke your inner fire, which raises your metabolism. Everything works better, when you’re in your body, in your flow, including your ability to digest, absorb, assimilate and eliminate – you extract the goodness and release anything that doesn’t serve you on all levels. Which leads me to conclude that the connection to, and expression of, who you are is what matters most to good eating habits. It’s a matter of being your Self. The bonus? When you’re satiated at a deeper level, you body won’t be looking for the love, connection, attention and fulfillment in a bag of chips or a pint of ice cream. Note: If you’re working hard to lose weight or have just started a running program or intense exercise of some sort, and it’s best that you do count calories for a time, read this first. What do you notice your body doing during a meal? Does it change depending on the day? When you share your thoughts in the comments, you open the possibilities for others. Pass this along to your calorie-concerned friends using any (or all!) of these links. I Know What to Do, I Just Don’t Do It. There are only so many hours in a day. You only have so much creative energy and only so much will power. 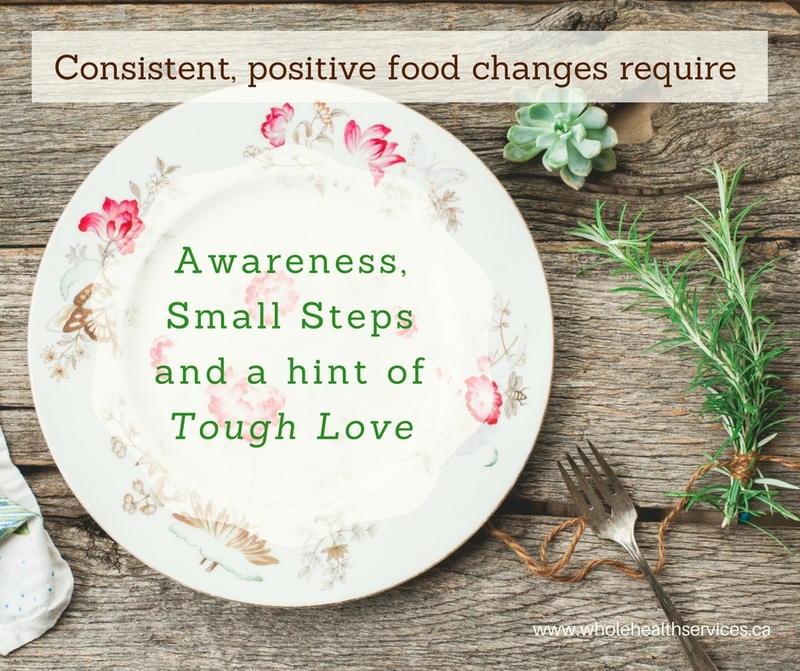 You’re keeping the family happy, you’re effective at work; how can you be expected to be consistent with positive food changes? You know perfectly well that to lose the weight, heal your digestive woes, calm the allergies, you’ll have to cut out an entire grocery list of foods & additives, squash a lifetime of bad eating habits, and probably eat more vegetables. The theory’s all mapped out in your head, but you just can’t seem to put those good intentions into action. Instead, you use what precious little energy you have left at the end of the day to beat yourself up about everything you should be doing while mindlessly inhaling a pint of cherry chocolate with a salt & vinegar chaser. It’s a slippery slope, isn’t it? You start by taking stabs at your poor food choices, until your mind inevitably points out how you haven’t been feeding the kids so well lately, not to mention all the other bad parenting moments you’ve had this week, …how did you think you can be an effective parent with everything else you’re dealing with? What were you thinking? Did you really think you could manage it all?…Is this boat you’re in all your fault because you chose the wrong man in the first place?…And now you’re going to be a fat, lonely slob for the rest of your life! Right now. Just stop. Take a breath. We’ll look at the mindless junk food habit next time; for now, let’s talk about the self-flagellation. Would you talk to anyone else that way? Would you tell a friend what an idiot she is for eating ice cream or getting divorced? I’d wager not. It’s time to stop being so tough on yourself and try a bit of tough love instead. You know, set yourself straight in the kind way you would with a small child you care about. Another good theory, but it’s where you get stuck in the follow-through. It comes down to perfection. That habit you have whereby, if you’re not going to do something to the letter, the way the experts and the health nuts do it, you’re not even going to bother. Tell me, if the boss handed you a list of what she expects you to accomplish over the next 6 months, and told you to get it all figured out tomorrow, you’d freak out, right? You’d quit your job, or report it to the higher-ups. If, however, she explained the big picture of the goals she wants to reach by the end of the year, then gave you the first pieces to start on, it would be simple, doable. Same goes with how you nourish yourself. If you’ve given even half the thought to all the possible solutions you’ve googled, there are likely a few options that stand out, whether you want to admit it or not. Trust that wisdom. Chances are there’s a reason you zoned in on them. Of all the things you know you need to do to get your body back to its happy place, pick one. Just one. It will likely be complex in and of itself. For example, giving up dairy is one thing you know might help your digestion. In the same way you would track the metrics and such of how your work project is progressing, you can understand how well these changes are helping (or not) by observing your body, your energy, your moods. Notice how you feel after a meal without the usual ingredient. Notice if any of your symptoms calm. Maybe nothing happens after a week of no milk, but eliminating the cheese then makes a difference, …does it improve more when you reduce your dairy sources even further? What happens to your appetite, your hunger and your satiety? What happens to your cravings? Has your sleep improved? Your energy? Notice where you still get stuck. Have you run out of ideas? Do you lack motivation? Would you kill for a piece of cheese? Every journey of a thousand miles starts with the first step. Same applies to self-care habits. Pick a habit to change. Trust yourself to stick with it. What do you KNOW you have to change and where do you get stuck? When you share your thoughts in the comments, you open the possibilities for others. Know someone who’s been lacking consistency in her food habits? Send her this post using any (or all!) of these buttons. Can Your Body Handle Changes in your Life? You drag your feet to the end of each day. You catch every virus going. You can no longer eat (or drink) like you did when you were 25.Your nagging little digestive pain isn’t quite so quiet. You go from caring too much about things to not caring less. What’s going on with you lately? Are you falling apart or just getting old? Or is it that life has taken a left turn and you’re not quite able to keep up? Who was it who first said that change is the only constant? Some changes are well thought-out choices, some are inevitable, and some pull the rug right out from under you. This is true for all of us. Becoming a mother, losing a mother, losing a job or starting a new one, divorcing your husband, the kids moving out, a diagnosis (yours or another’s),… Life is full of transitions, with an ever-evolving need to recalibrate. I’ve seen how outer transitions clearly show up directly in the body – in clients whose discomfort with a certain situation manifests as physical discomfort, disease and pain. Occasionally these women are conscious of that connection, quite often they’re not. The professional who woke with labyrinthitis (dizziness from an inflammation of the inner ear) the week she retired. In my 30s, my own expanding waistline signalled a need for me to grow in a different way. Think about it. When you’ve felt your worst in body, had something major just shifted (or wanted to shift) in your life? Could it be that these symptoms you’re experiencing during life’s transitions are a message from your body that something needs to change in YOU as well? Health, by definition, is a balance whereby you have what it takes to cope with, and recuperate easily from, whatever ails you. When your life changes, it necessarily sets you off balance. In the best case scenario, you’re in a place in your body, mind and soul where you can regain your equilibrium without much ado. However, when the transitions coincide with your usual aches & pains getting the better of you, or new ones showing up, when your anxiety’s up or your energy levels are down, it’s a sign that you were thrown more off-balance than you’d realized. Your symptoms are a sign that you need to care for yourself more thoroughly, more consciously and more deeply than you have been. I know what you’re thinking. When things are in flux – even when it’s your choice and all for the best – you’ve got to make sure everyone around you is looked after, not to mention the details and to-dos. How can you possibly think about yourself at a time like this? If there’s one thing I hope you’ve learned by now as a wife and mother and multi-tasker extraordinaire, is that you can only be so, effectively, from a full cup. Perhaps the discomfort you feel at these points is actually your body reminding you that NOW is the time to look after you. Dare I say, it’s the perfect opportunity to dig deeply into what YOU need to survive the upheaval and land on the solid ground of who you are. I’ve spent the last year riding a physical, mental, emotional roller coaster through a move from my lifelong home in Montreal to Ottawa. Under two hundred kilometres’ distance, but light years in how far I’ve come in myself. Perhaps it’s this experience that has pushed me to own up to a strong compulsion to help women struggling with the pain of change to reach a new normal. More than finding a healthy balance, I want these women to thrive, even blossom into their full, beautiful potential. As a result, my work is undergoing a slight transition of its own. My client work still revolves around encouraging you to listen to your body for making your best healthy choices. My writing will continue to offer tips, stories and inspiration for finding whole health from the inside out. I will still encourage conversations in the Whole Health Dinner Party group around the same. The upgrade will be that my focus is now on supporting women who feel the shifts and changes of life take a toll on their body, guiding them to care for themselves in ways that allow them to land safely, feeling healthy, on the other side. If this is you, tell us how change affects you, and where you need the most support when life changes directions. When you share in the comments, you open the possibilities for others. Be sure to sign up in the box below, so I can continue to support you fully. If you have a friend who could use an extra hand to hold while she crosses the ravine of another transition, please get her in on the conversation by using any (or all!) of the pretty green buttons.